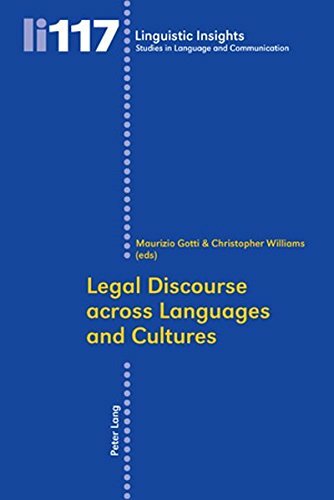 The chapters constituting this volume focus on legal language seen from cross-cultural perspectives, a topic which brings together two areas of research that have burgeoned in recent years, i.e. legal linguistics and intercultural studies, reflecting the rapidly changing, multifaceted world in which legal institutions and cultural/national identities interact. Within the broad thematic leitmotif of this volume, it has been possible to identify two major strands: legal discourse across languages on the one hand, and legal discourse across cultures on the other. Of course, labels of this kind are adopted partly as a matter of convenience, and it could be argued that any paper dealing with legal discourse across languages inevitably has to do with legal discourse across cultures. But a closer inspection of the papers comprising each of these two strands reveals that there is a coherent logic behind the choice of labels. All seven chapters in the first section are concerned with legal topics where more than one language is at stake, whereas all seven chapters in the second section are concerned with legal topics where cultural differences are brought to the fore. If you have any questions about this product by Brand: Peter Lang, contact us by completing and submitting the form below. If you are looking for a specif part number, please include it with your message.